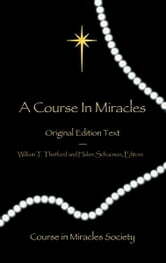 A Course in Miracles (often called just “the Course”) is a self-study course for retraining the mind that is spiritual, rather than religious, in its perspective. Although it uses Christian terminology, it is ecumenical in its approach, and its underlying ontology is reminiscent of ancient refrains, echoing the world’s most hallowed traditions. The Course is pragmatic in its method, and its aim is a peaceful mind: “Knowledge is not the motivation for learning this course. Peace is.” Nevertheless, the Course frequently emphasizes its simplicity. The edition of A Course in Miracles that is reproduced in this volume is sometimes referred to as the Hugh Lynn Cayce version because, upon completion, it had been delivered to Hugh Lynn Cayce, son of the renowned psychic Edgar Cayce, in 1972, before the manuscript was subjected to the substantial editing process that is described below. Way beyond what a human can be expected to write from deep reflecton of life as is rather than it is perceived. No easy read to start but deeply consistent and compelling in its internal logic. Life as a gift in heaven. Life as a fundamental choice of love.